My first attempt at any type of serious digital astrophotography. The RAW file had a ton of noise, which I removed using Canon Digital Photo Professional. 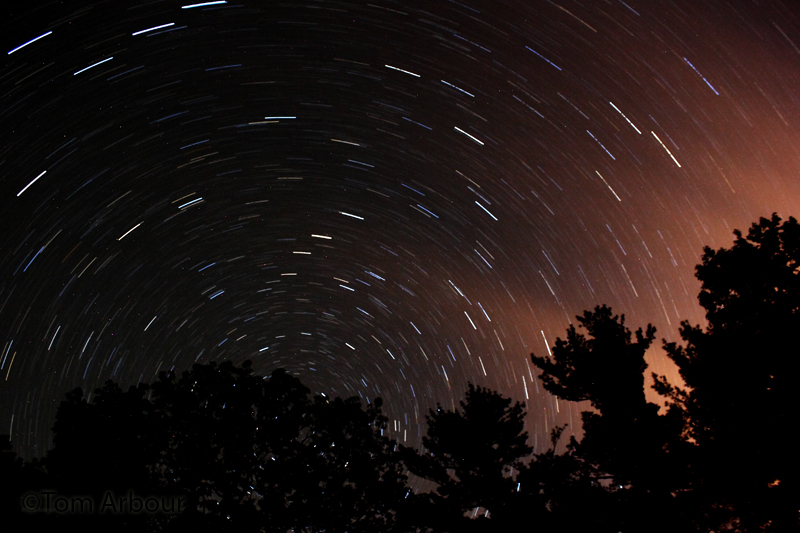 This is a manually focused, twenty-two minute exposure. When we go back to Maine in less than a week, I hope to perfect my technique- The clouds on the right were lit by the neighbor's home, about one-half mile down the road. My first SkyWatch Friday post in quite some time. beautiful frame, then after the whole story seems like something good came out. Really stunning shot! Terrific colors! Cool use of techniques, sure adds fun the the views in sky watch friday. Beautiful work. I´ve never seen like that! Your photography is amazing. I really like this Skywatch Friday contribution. Tom, This is a surreal and stunning night shot! I like the way the neighbor's lights leak some pink into the picture. Very interesting shot. I'll have to try that some time. Tom, I'm glad you skywatched this week, because I hadn't been aware you had a second blog. These are fabulous photos! I have tried this on a sunset shot and have the Digital Professional so I must try this again....and hope you will expand more and do more of these. cheers. Lovely work, Tom. You have inspired me. I'll be spending some time in a place with a good view of the sky, and I'll have to try some star trail photos of my own. Oh, and I also loved Megan's head shot. She still has mommy-glow, I think. Tom: That is a WOW shot and so well thought out. Thanks for shaing the movement of the Earth with us. Wowza, now that is a different submission for Sky Watch Friday. Great idea! an impressive and inspiring photo. Well what a unique way of producing a Sky Watch shot... I wish you well perfecting this technique in the future and I can not wait to see more results. Tom - I am so glad I found your site. These photos are stunning - all of them. You're going to have an incredibly good time shooting the sky in Maine - it's a wonder - assuming that your heading to someplace a long way from the cities. Other than high in the Rockies in Glendevy, CO, I've never seen skies so black and stars so bright as in Maine. The fisherman on Lake Erie and the sunset at the dock shots are really amazing as well. I'll be, you know, around again. Makes me dizzy looking at it! Very nice shot. Must try this again myself soon! This is wonderful! Only 22 seconds? Never mind...you said 22 minutes--I can't wait to see what else you do when you go back. How unique. I went back and looked at your older photos. Really enjoyed visiting your site, wonderful pictures. Great image - what f-stop were you using when you made this photograph?